Just then, the man panics. He flails around, knocking off his rescuer's mask and wrapping his head in a bear hug, trying desperately to climb out of the water. Both men vanish below the waves. After several seconds, the rescue swimmer surfaces, looking about frantically, his mask and snorkel gone. He's broken free, but he's lost his victim. A piercing whistle blows, and the howling wind and rain stop as if on cue. At the push of a button, the thunder stops, the waves slosh down to stillness, and the house lights come up on the U.S. Coast Guard's cavernous new $30 million Rescue Swimmer Training Facility, in Elizabeth City, North Carolina. 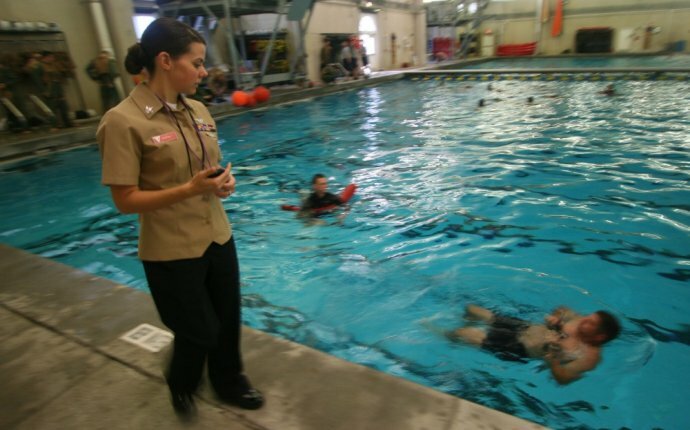 Known among Coasties as A-School, this is where enlisted airmen come to test themselves against one of the most grueling training regimens in the armed forces – 18 weeks of relentless physical punishment – hoping to join the elite ranks of the rescue swimmers, among the most fearless first responders on Earth. It is a challenge many of them will fail. Chief Petty Officer Ken Kiest, a burly 50-year-old with a shock of white-blond hair atop an otherwise shaved head, calls the swimmer to the side of the pool. "You let the survivor die; is that correct?" Kiest shouts. "Would you do that in the real world, let my daughter die? You fit to train?" There's no response, and Kiest reddens, shouting louder. "Are you fit to train?" "Yes, Chief Kiest, " the swimmer replies. "Obviously your lead instructor says otherwise. Get out of the water." The swimmer hauls himself out and carries his mask and flippers glumly to the locker room. By the end of the week, he'll face a board hearing, and will ultimately be sent "back to the fleet." If he wants to try A-School again, he'll have to reapply and start from the beginning. Rescue swimmers – properly named "aviation survival technicians" – are a superfit, crazy-brave cadre deployed with the Coast Guard's search-and-rescue helicopter crews. They are trained to save anyone in distress: injured fishermen, sick cruise-ship passengers, raft-bound refugees. To do it, they drop, alone, into nightmare conditions, from subzero waters to hurricane-force winds. During Hurricane Katrina, the Coast Guard, drawing on 80-plus rescue swimmers, rescued more than 33, 000 people. "When Mom and Pop need to be rescued, we're the professionals, " says Kiest, who went through the program himself in 1990. "In emergency, break glass and pull out Coast Guard."